You are here: Home / CAL-KAL / Yarn Thing CAL-KAL with Marly Bird and WENDY BERNARD! 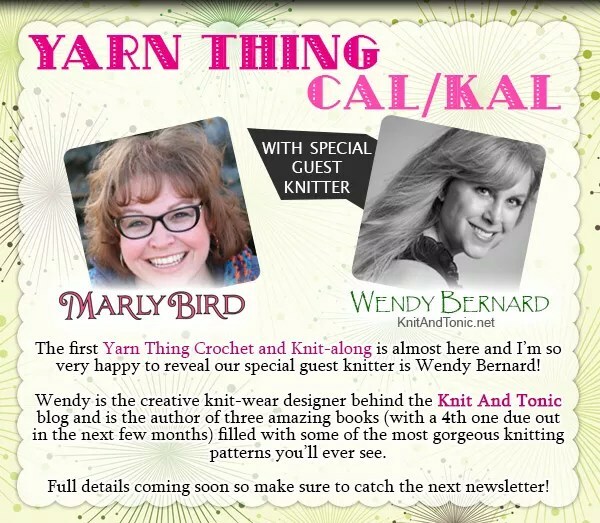 Yarn Thing CAL-KAL with Marly Bird and WENDY BERNARD! As you can see from our posts on Facebook, Twitter and Ravelry, Marly is a little swamped so she asked if I could put together some information about Wendy. Then, assuming that Wendy is busy too, I sent her an e-mail with a few questions we would like to know. I appreciated her responses so much that, rather than edit what she said, I will just let you read it as I received it. Tammy: Do you prefer Knit or Crochet? It sounds like a stupid question, and I’m assuming Knit because your designs are all knitting but do you ever crochet? You mentioned you were doing some sewing at that time when you were on Yarn Thing, how is that going? Wendy: I do prefer to knit although I do crochet for fun sometimes. I also sew and embroider like crazy. Crochet, sewing, embroidery, Temari are all relaxing activities for me. Unless I’m knitting something like socks or a cap (which I feel can be relaxing), I don’t knit for relaxation, probably because I consider knitting and designing knitting patterns is what I do for a living. Tammy: You mentioned that your grandmother taught you. Did you have any other training or work in fashion? You mentioned you have a publishing background and also that you started designing because you were altering other patterns. What gave you the thought of altering a pattern before you started researching those methods? Was it simply knitting for your child that pushed you over this designing edge? Tammy: I personally love a couple of your designs, one is ‘Jordan’ which is a beautiful lace tunic, and the other is ‘Hana Hou’. I’m sure you’ve been asked a million times about your inspiration, but between this FEMININE tunic and a FUN felted Ukulele bag, I’ve got know. What makes you get stoked about a design? Do you wait to be excited about a yarn you’re asked to design with, or is it a theme? You’ve mentioned that Elizabeth Zimmerman inspires you, as she does us all. Is there other designers’ works that get your creative juices flowing? Wendy: This is the hardest question for me to answer. Basically, I knit things that I would want to wear or use. It’s as simple as that. If I see something on the street that inspires me, I’ll go home and sketch. After that, I’ll find the appropriate materials. It’s harder for me when someone sends me yarn and says “design something.” I prefer to want to make a particular looking item and after that find the yarn. Does that make sense? As far as other designers’ work that inspires me, there are quite a handful, but not necessarily knitwear designers. I like to look at magazines like Vogue (not the knitting one) and InStyle and I like going to Malibu or to Los Angeles and people watch. It’s fun to see what the younger set is wearing on the streets. Because of the climate, it’s a little harder for me to focus on items that are meant to keep one warm! Tammy: With Marly Bird you are doing a Crochet and Knit -a-Long. There haven’t been any details yet even as far as what type of project are we knitting, as in Clothing item or Accessory. Besides getting to work together with Marly (smile) is there something about this particular project that tickles you? Wendy: What tickles me is that I never did entrelac before! (Folks — I think that was a BIG CLUE about what we will be creating in the C/KAL!) I didn’t even WANT to do entrelac as I didn’t like the idea of turning my work every row or round. Also, I hadn’t really ever seen an entrelac item that “spoke” to me enough to make me want to learn the technique. But when Marly brought up the subject of doing a K/CAL, I thought “why not?” I had this great ombre lace on hand and, well, why not? I took a craftsy class and figured out how to do some basic entrelac and knit backwards and now I’m addicted to entrelac! It is so much fun! Tammy: Do you teach? Are you going to STITCHES West or any other events coming up? Wendy: I do teach locally, but that’s about it right now. I don’t travel that much because I have a young daughter and my husband often works weekends. I also have no local family to help out. Once my daughter gets a little older I might consider traveling more often, but for now, I do teach locally and go to TNNA for book signings when new books come out. Wendy Bernard currently has 141 designs listed in Raverly, so after you check out her website www.knitandtonic.net I would head over there to her designer page (http://www.ravelry.com/designers/wendy-bernard). I’m sure there are lots more goodies to come while we work on our Crochet or Knit -a-Long together. I can’t wait to listen to that interview.